The last decade has drastically changed our idea of availability. Before, we used to get no more than one mail delivery per day, and the only way to be reached by phone was through a wired one. The arrival of the Internet and mobile phones, providing faster and easier ways of communication, has definitely changed people’s expectations. Today your are expected to be reached anywhere and at any time. An artwork that deals with these questions is the very sweet project Real Snail Mail™ by boredomresearch. The work will be exhibit at the Soft Control: Art,Science and the Technological Unconscious Exhibition from 15th Nov – 15th Dec 2012, Maribor, Slovenia. Some time ago, I changed my e-mail setting Check for new messages from Every 15 minutes to Manually. Before that I heard a Purr each time I received an e-mail. It is actually a rather nice and soft sound, but I receive approximately 25-50 e-mails per day. Each time the mailbox called for my attention with its purr, I interrupted my work, as I felt that I needed to know who was contacting me; thinking it could be something very important that I had to deal with right away. My work flow was constantly interrupted and it all became very stressful. In the work Real Snail Mail boredomeresearch uses real snails to transport the e-mail to its destination. On the Real Snail Mail website you can write and post your e-mail. 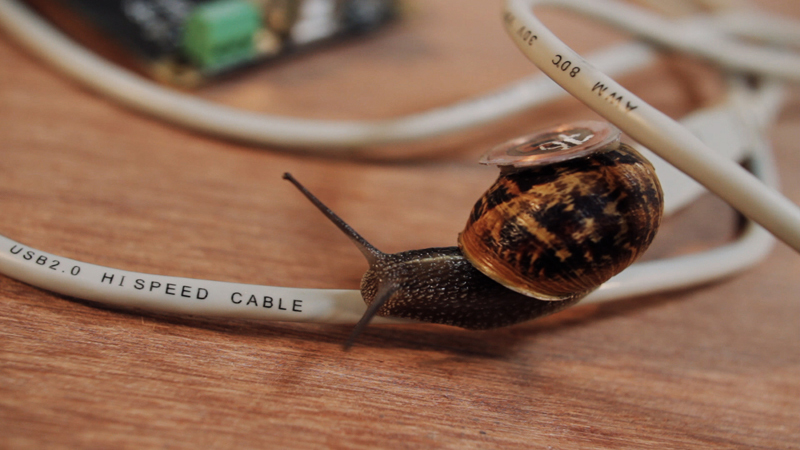 Each snail is equipped with one tiny electronic circuit and an antenna. 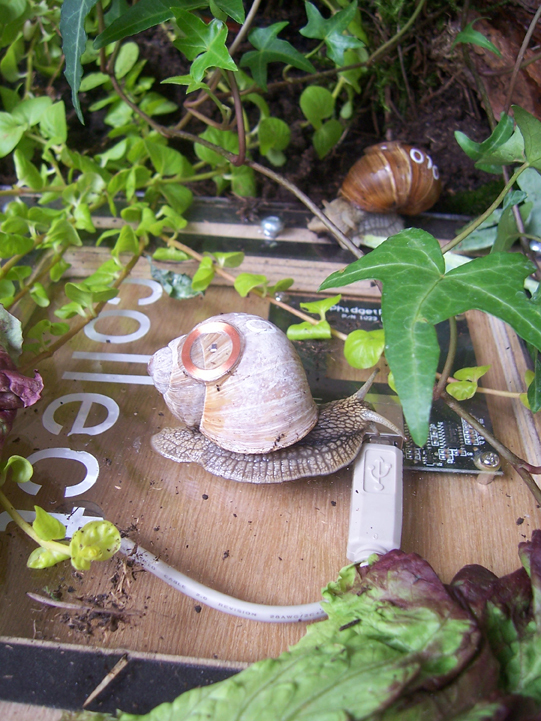 Inside the snails’ enclosure, there is one dispatch centre, where the snails pick up their mail, and one drop off point, where they leave it, so that it can be delivered to its final destination. It can take several months, or even years, for the mail to reach its addressee, so it is advisable to choose your words and to write carefully. Behind boredomresearch is Vicky Isley & Paul Smith, UK. Visit the Real Snail Mail website. Here you also find a really nice and new documentary of the artwork.